Laser resurfacing is a procedure which is aimed at rejuvenating the face. It works by injuring the top layers of your skin, the epidermis, causing a signal which promotes regeneration of new skin at the top layer of the skin. While laser skin resurfacing is an effective method for prompting fresher, more youthful facial glow, there are some risks that take place at various layers in the skin which can cause fat volume loss. Because of this fact, I rarely, if ever, use laser resurfacing for facial rejuvenation. Instead I use fat grafting, aka fat transfer. Why? Because with laser, regeneration of the skin is prompted by destruction and that destruction can also cause fat volume loss. 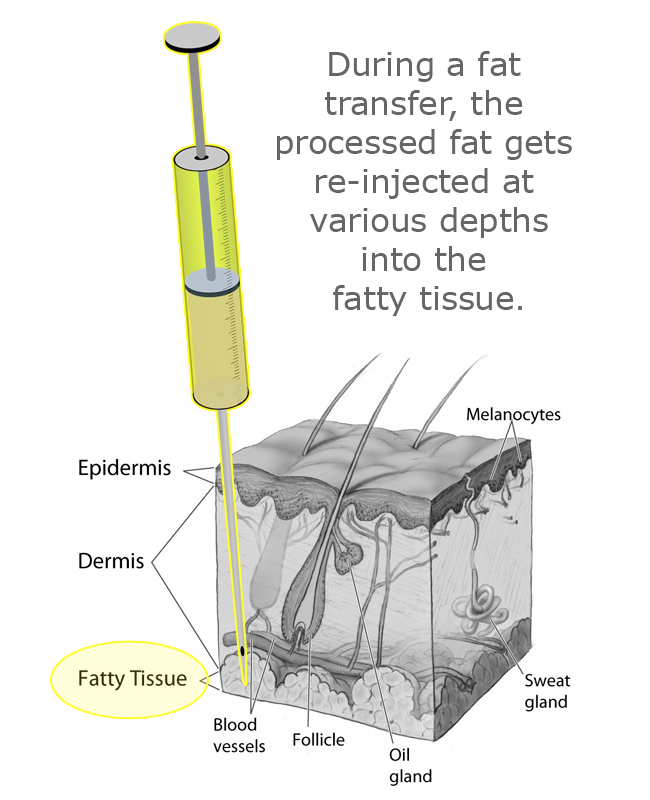 With fat grafting, regeneration of the skin is prompted by signals sent by adipose stem cells which reside in the fat that is injected into the subcutaneous layer. With fat grafting, instead of a loss of volume, there is an increase in volume. Volume is increased by direct injection of fat as well as the fact that the process does not destroy cells as laser can do. Why do some people experience facial fat loss after laser resurfacing? 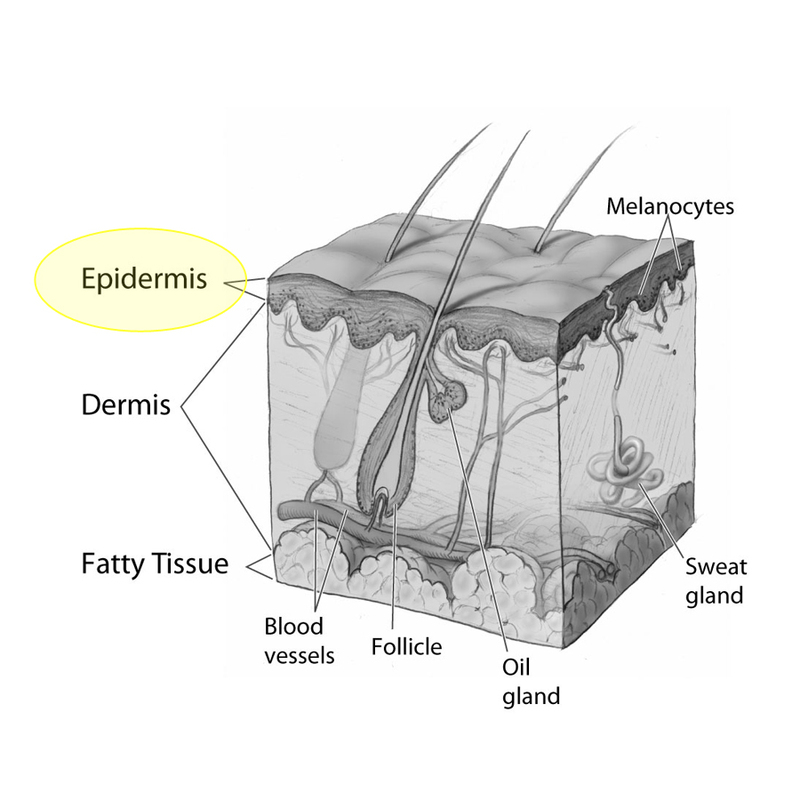 Anytime you introduce an energy source into the body, whether it be radiofrequency, or laser, or even CoolSculpting – which is specifically designed to injure fat cells – the cells that are damaged release what’s called DAMPs (Damage Associated Molecular Pattern Molecules, aka Danger Associated Molecular Pattern Molecules) and those DAMPs signal other cells. If the signals are severe enough, or a particular kind,the DAMPS can trigger a process called apoptosis, which is programmed cell death, and that keeps on going for weeks or months after the original injury so that patients that have had laser, or patients that have had radiofrequency, or patients that have had CoolSculpt, will continue to have subcutaneous fat tissue loss as a result of that radiofrequency. Something that is designed to tighten your skin, ends up causing damage further on below the skin and to the fat tissue that’s right under the skin. It replenishes the fat that was lost. The stem cells and regenerative cells in the fat, restore the integrity of the tissue that was lost after the injury. I now rarely, if ever, offer laser resurfacing as I feel that fat grafting does a much better job at facial rejuvenation. I have been talking about the benefits of facial fat grafting for years and I find that we are doing more and more facial fat grafting procedures as an alternative to facelifts. Likewise, fat grafting is the perhaps the single best solution to fat loss that occurs following laser resurfacing. If you have had this happen, a fat transfer may be exactly what the doctor ordered! Dr. Rodriguez currently serves as President of the International Federation for Adipose Therapeutics and Science (IFATS), a non-profit, scientific organization devoted to studying the properties of adipose fat and related technology. The illustrations above were created using the skin (layers, glands, vessels) illustration by Don Bliss via Wikimedia Commons. Pertaining to DAMP, does this process eliminate the whole cell or just it’s contents? The cell is completely processed by inflammatory and scavenger cells so the entire cell (broken up into smaller units) is eaten up by other cells. Pertaining to DAMP, when the cell dies does the whole cell get removed by the body or just the cell contents? This is such great information. I rarely see practitioners reporting facial fat loss as a side effect of laser treatments. It raises the question of informed consent, as patients need to be aware of all possible side effects, no matter how rare! Studies suggest that a lot of people have unrealistic expectations with lasers and radio frequency treatments as they are often marketed as ‘non-surgical facelifts’. This is misleading and leads to patient dissatisfaction. I have had the laser genesis treatment to improve mild acne. While it did improve my mild acne, I now have more noticeable expression lines on my forehead. I thought that it was a coincidence until I read your article. I have read many accounts of people losing facial fat volume after radiofrequency treatments, which doesn’t seem surprising considering the same treatment is marketed for fat loss on the body. Thank you for your informative article and bringing this issue to public attention. Sorry to get to you so late, but how is it going with your facial volume? You are young, so I think you will be OK, but let me know! Sorry to get to you this late after your surgery, I do not use this blog as a patient contact form. But definitely I can help you with fat grafts, and I have done it for several patients already. Ironically the first few were my own patients from when I used to do laser. I have stopped doing Laser completely. Fat does regenerate and rejuvenate the tissues. It will thicken the sink and restore subcutaneous volume. I am devastated by what two laser genesis treatments did to my face. They told me all these great things would happen but what happened is that I lost all my facial volume. It is only been 2 months and I am terrified to see what will continue to happen now. The volume loss was dramatic and began to show up within 2 to 3 weeks. Now when I make Expressions there is so little flesh underneath the skin to support it. All my skin piles up and makes deep lines across my forehead and across my upper cheek bones where I used to have fat pad. I had the most beautiful lines in my face and now it is just all flat and I don’t look like myself at all. It even made my nose look bigger and relation to my face and my jaw is sharper and angular. I am devastated because I am not a candidate for the permanent fillers due to medications I am on and I cannot afford fat transfer. I’m not sure what to do, I am just miserable every time I look in the mirror or take a photograph. I was doing pretty well for 50 years old and was often mistaken for being 30, but that won’t happen anymore. I look just like my 70 year old mother now as far as facial volume goes. I didn’t do this procedure because I am vain. I have put off doing anything to my face for a very long time, but its long history of medical issues and medications and the son had done some damage and this was what was recommended. I went to the Laser Clinic because they still have $400 of my money and they try to lie to me over and over and say the lasers couldn’t do this to you, but I know it did. I can still feel a strange tightness under my forehead and when I touch my face I don’t feel any of the flesh that used to be there, I just feel skin and bone. I looked into getting temporary fillers but they said it would be a waste of money because I would keep having to do it over and over, and I’m afraid of the risks of hitting an artery and affecting my vision permanently. The last thing I want to do is add one mistake on top of another. I was trying to keep my appearance up because my fiance is 10 years younger than me, and I don’t like being mistaken for his mother, since he also looks younger than he is, but I guess I’ll have to get used to that now. This has been very depressing. Stem cell production is age dependent. So is potency of the Stem Cells. Any energy source directed at the subcutaneous tissues has the potential of causing “apoptosis” (Programmed cell death) of the subcutaneous tissues. I have seen it mostly in premenopausal women, but also in some women in their thirties. The best answer is the old plastic surgery saying: Replace like with like. In the case of fat the best replacement is fat, with the added attraction that it has stem cells in it to help stimulate rejuvenation of the tissues. Hi i stumbled upon this via google from researching treatments to restore volume loss in my mid 30s. are there any lasers or light sources in your knowledge that dont cause this effect of fat atrophy ? or that can even cause fat cells to grow ? can prp and microneedling effect fat cells to grow ? is there anything that can be used with or staggered in treatment with fat stem cell transfer to help the body make its own new fat cells ? thank you for your time. Difficult to predict what will happen. I think volume loss is more common at the perimenopausal age group. Your volume loss is probably done by now. But in the future, for skin rejuvenation think more fat grafting than laser. Fat grafts have stem cells in them that actually rejuvenate the skin. If you have broken capillaries, there are lasers specifically tuned to the wavelength that affects blood vessels. Consult with a laser specialist that does not do a lot of cosmetic procedures. Cosmetic laser dermatologists tend to push a lot of skin tightening procedures. Don’t go for a modality that treats a large patch of skin, go for something that is very targeted at the blood vessels. Thank you so much for this information. Up until reading all the information on fat loss caused by lasers, I had been considering IPL or VBeam but now I am not. However I have broken capillaries on my face and was wondering if there was anything you could recommend? I had some broken blood vessels and the spa recommended an IPL. The technician told me she was turning up the volume for treatment but wouldn’t go deep. I ended up with burns, and now have scars, fine lines, orange peel and fat loss. I noticed over months my skin kept looking worse. I read your post about DAMPS, so I decided to post. My first and only experience with a laser, broad wave band…what can be done to improve the texture? Chemical peels act directly on contact, so their effect does not go beyond the peel layer. Laser and ultrasound, being energy sources have their maximum effect at a designated point, but there is an area of decreasing effect radiating outward. It is these areas of decreasing effect that cause problems, because they are damaged tissue that remains and must be dealt with. The damage is caused by the response of the body to the damaged tissue. Can chemical peels also lead to fat loss? I trust your input on lasers and I value your response on chemical peels. Thank you. Yes the fat loss is related to the Fraxel. I have seen it in my own practice and it is why I stopped using Laser. The solution is Fat grafting. Check out our other blog posts on fat grafting to see why it is very important to check that the surgeon processes and injects the fat correctly. Your solution exists, and it is correctly performed fat grafting. Last year I had a cuople of sesions of laser fraxel repair and restore with a machine called Lynton Award Winning Fractional Laser machine ( that what they said). I experienced fat loss on my cheeks and on my temples a couple of months later, everybody told me what happened to me , they think I have loss weight and Im afraid it was because of the laser. They told me that this is imposible but I don’t believe it, because many years ago my dentist applied a laser ( I don’t know what kind of laser was that ) on one of my cheek to lower the inflamation he caused to break my tooth and I lost fat on that cheek!. I feeling very depressed, I had panic attack thinking that this might be getting worse. I looking for a solution. I live in the Uk. I don’t think many surgeons are aware of this and it doesn’t happen on every patient. But it happened to me twice in the early 2000’s and it was a shock to me when it happened. Since then I got rid of my Laser practice. Fat grafts are very effective in restoring the tissue defects and rejuvenating the skin. I do both clinical and lab research on this and can assure you the effects of fat grafting on the tissues are real and well documented. We have many patients from out of town, so I encourage you to visit. Contact kelly@cosmeticsurg.net and we can set up a virtual consultation with Skype or FaceTime. Looking forward to a consultation! I had co2 laser done under my eyes. Everywhere the laser hit it left a deep permanent mark. However, the worst thing to come out of the procedure was the significant fat/volume loss all over my face. I even think it did something to my nose, but from what I have read the nose doesn’t have fat. My question is how are the companies who make these lasers allowed to keep marketing and selling them as if they don’t kill fat? I live in Oklahoma and none of the plastic surgeons will admit it causes fat loss. I knew I wasn’t crazy. I’m not understanding why the FDA hasn’t stepped in. I wasn’t even warned that fat loss was a possibility.It’s hard to get help when there is no documentation or drs in the area to be experts on the subject.I am now considering fat grafting,I am going to contact your office to see how things work with out of state people. Thanks for your article! The more superficial a laser is, the less damage- but also the less effect on the skin. IPL’s are a little different because they target specific pigment types. But my general point is that most energy based therapies work by injuring the tissue in one way or another then creating an inflammatory response followed by a regeneration response. The new “collagen” formed is not the elastin type but predominantly the collagen associated with scar tissue. The ultimate aim of all these therapies is to make the skin BE younger so it will appear younger. That is why I love fat grafting. The act of liposuctioning activates the stem cells in fat tissue, and if you process the fragments carefully, when they get injected into solar damaged or aged tissue the stem cells trigger a regenerating response that actually replenishes and rejuvenates the tissue. Many studies have been done to show increase in dermal thickness and restoration of elastin fibers, both characteristics of younger skin. Wouldn’t the type of laser or radiofrequency device differ in their affect on fat, related to the fluence of the laser or the type of penetration? Ulttherapy skin tightening, for example, I would expect to have some impact on the subcutaneous fat. But why would something that doesn’t penetrate past the dermis – like clear + brilliant, lasergenesis, even light based like IPL affect the fat cells? Is the mechanism you’re suggesting that if any layer of the skin creates DAMPS that it triggers DAMP cascades in other layers nearby that weren’t directly affected by the laser? I’m interested in getting IPL and have been considering clear+Brilliant or lasergenesis but wanted to clarify first so as to not worry about fat loss. If that is the case I’d prefer to avoid! Also I’m a biochemist and this is really interesting. Thanks for sharing. At this point the solution to your problem is not more machines, but restoring what you lost. What you lost is fat, therefore you would benefit most from fat grafting to the face. In addition to the restoration of volume the stem cells in the fat graft will regenerate the tissue and make your skin younger and more healthy. Be very careful about who does the fat grafting, they should use very specific methods to process and purify the fat. I have suffered fat loss from just one fraxel treatment. I am shocked!. Is microcurrent, as in a microcurrent facial damaging as well? And if I may ask what machines use radiofrequency? Not everybody loses subcutaneous fat with CO2 laser. But when it does, it’s a big headache. I did profractional laser with 25 microns. I didn’t experience fat loss, maybe bcs it’s not deep. It’s good to know that laser can cause fat loss so we don’t go for deep treatment. Thanks. Sorry for getting back at you so late. This blog is more for giving out information than as a social network so I check it out only once in a while. At this point, your best option might be fat grafting. The stem cells in the fat graft will not only replenish lost tissue but also rejuvenate existing tissue. Thank you for your sharing of information! I believe that volume loss has started since getting fraxel laser 1 week age. Is there a way to stop the apotosis process to prevent further loss? Please advise. I am willing to try anything to stop it. The first thing to do after any treatment is to wait for at least 2-3 months to see what the ultimate results are going to be. We have seen a lot of cases of fat loss after Laser, and for that reason I got rid of my own Laser service. Fat grafting does have stem cells in it which would help rejuvenate the skin and thicken the dermis. As to you in particular, If you want a more specific answer I would need to know more. You can contact Kelly at kelly@cosmeticsurg.net if you are interested in a virtual consultation. I have come across this because I had a very strange experience after laser hair removal on my face. I’m 39 and I just wanted to stop shaving and to get rid of the 5 o’clock shadow. I went to a board-certified dermatologist to have this done. I only had 2 sessions and 2 and half weeks after my 2nd session, I noticed a wrinkle or laugh line. I had absolutely no wrinkles or laugh lines before this. None. I noticed this immediately. It seems to have gotten marginally better since the day I noticed it but it’s still not anywhere near where it was before. Like I said, I had nothing. I’m starting to believe that this was because of some sort of volume loss (which I guess is the same as fat loss). I went to the doctor yesterday and showed him. He said that he didn’t think it was because of the laser. It is. There is no doubt about it. I’ve never had this before and now it’s there, all of a sudden. It was 100% because of that. Anyway, he said that he has seen fat loss because of laser hair removal before but those cases were when the settings were extremely high and were accompanied by burns on the skin. I did not burn in any way but I must admit that the first session, in particular, was very, very painful. Again, I didn’t get any burns or anything but I did experience folliculitis for a couple of weeks. The second session was also somewhat painful but nothing like the first. I think that this may have caused this wrinkle that I’m seeing. Maybe it resulted in some fat loss or something. 1. Could this be just temporary fat loss and can my body replenish it in time? Could it be that the actual cells weren’t damaged and it was temporary fat/volume loss? I’ve read that laser hair removal is a relatively minor procedure. It’s so hard for me to fathom that it could cause permanent damage such as this. 2. If I ever were to do a fat transfer, would that solve my problem? Is this a temporary fix that will eventually wear off or will my body just accept it and pick up where it left off before the laser hair removal? I’m sorry for the length of this post but would like to thank you in advance for your time. I hope everything turned out right from your carbon peel. By now it has been approximately 6 weeks and things should be stable. As I have said before, the solution to this laser damage to the subcutaneous layer of fat loss is to restore the fat. You may need fat grafting, but I would have to see pictures or have a virtual consultation with you . Hello, I have been doing some research online over the past couple of days, and you are the only doctor that I have run across that admits to the possibility of fat and volume loss from Laser treatments. Have you ever heard of Carbon Peels? If so, how likely is it that someone would experience fat loss with this. I had some damage with IPL in the past, and a lady just talked me into having a carbon peel done, and said it was simple like a chemical peel, but with a light laser. I am very concerned about the some of the ways that my skin is responding. I believe that I have lost even more volume in my face, and when I pinch the skin under my eyes, it sticks together. This has never happened. It has been three days since the procedure. I am hoping and praying each day that life jumps back into my skin. Please feel free to respond to my email thanks. Thank you for this information. After reading it I must agree that lasers aren’t the best way to go! Thank you for sharing the information about fat Loss. It is very beneficial for all who are little bit or more fat. Yoga is also beneficial for reducing fat.